Harga Motor Piaggio X Evo here is the average price of the Big City Like: Jakarta, Bandung, Medan, Surabaya, Semarang, Makassar, Denpasar from various stores and authorized Dealers. Piaggio XEvo is the latest stunning addition to Piaggio’s prestigious maxi scooter range. No longer must you compromise between comfort, style and space thanks to the launch of this impressive new scooter. 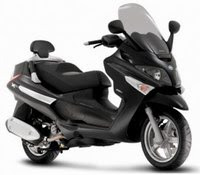 The Piaggio XEvo is an italian-made scooter line of vehicles, sharing various components and design, and sporting different engines sizes of 125 cc, 250 cc and 400 cc, and is a direct development of the Piaggio X8. All models sport a single-cylinder, 4-stroke, multi-valve engine that meets Euro 3 European emission standards, and have a CVT transmission. The 125cc has a carburator 124cc Lead engine, 14.9 bhp/11 kW, the 250 cc is a liquid cooled, fuel injected 244 cc Quasar engine that delivers 22 bhp/16.5 kW, and the 400 cc model’s Master liquid-cooled, electronic fuel injection 399 cc engine power output rates 34 bhp/25 kW.